This quote is from the PR materials accompanying my sample of Shalini Jardin Nocturne. Right now, I’m about as far from a Dubai night as you can get. I can’t drive anywhere, let alone in Dubai, because my 31-year-old pickup truck is in the shop. I live in the soggy Pacific Northwest, not a desert, and the only thing ceremoniously burning might be my toast. But I do smell pretty great. Shalini is an India New York-based couture line that perfumistas might know for its 2004 fragrance named, simply, Shalini. In Perfumes: the A – Z Guide, Luca Turin praised Shalini as a “sleek tuberose-based white floral with a deliciously bitter-fresh, almost fougère-like heart” before advising people to run from its eye-popping price. Maurice Roucel, who developed the original Shalini, also created Jardin Nocturne. It's an Extrait, and its notes include saffron, Indian jasmine, oud, sandalwood and musk. Listing these notes is something like reciting the ingredients for bread — flour, water, salt, and yeast. Yet bread ranges from flabby slices in a plastic wrapper to crisp artisanal baguettes. Jardin Nocturne smells like it didn’t cut corners. Jardin Nocturne opens with its star players — saffron, jasmine, and oud — on stage from the beginning. The saffron is strongest at first, and it draws out the part of oud that smells like iodine and the ocean. It takes only a minute for the jasmine to muscle past the saffron and oud, and “muscle” it does. Jasmine seems like such an innocent little flower, but this jasmine at this dose arm wrestles Jardin Nocturne’s oud for a draw. They’re well matched, and the fragrance feels peppery and skanky — it’s no innocent floral. Even the perfume’s rocket-fuel dose of jasmine can’t keep the afterburners roaring forever, and the jasmine eventually relaxes into the composition. Jardin Nocturne’s saffron wears longer than I’d expected and continues to smooth the jasmine, marrying it to the oud. This is where I like the fragrance best. It’s still all about jasmine and oud, but at last it feels satiny and subdued and more woody, but still a bit dirty. About half the time I’ve worn Jardin Nocturne, I’ve forgotten about it, only to have people complement me on it hours later when I was sure the scent had faded away. Jardin Nocturne catches people’s attention. It may not break artistic ground, but neither did Lana Turner. 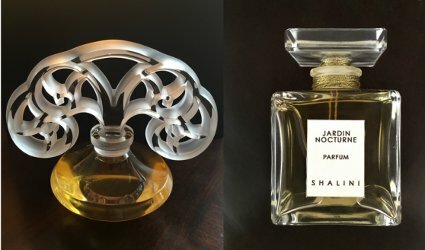 Shalini Jardin Nocturne Extrait is available in a dramatic Lalique bottle called “Le Tourbillons” for $2,400 for 50 ml. People with tighter (but still generous) budgets can purchase 50 ml in a “cubique” cut glass bottle with a glass stopper or a bulb atomizer for $500. Fifteen ml is $250, and 7.5 ml is $150. (If it helps, remember Jardin Nocturne is Parfum.) Jardin Nocturne will be available this month at Aedes and at Bergdorf Goodman in December. Didn’t Robin once have a “please, no more oud” tag? It does sound luxurious for fans of the note. Review reminds me that I’d love to test out the original Shalini. I know! We’ve had, um, “oud”les of oud. The word must have come down that this is the way to a new market’s heart. I’d like to try the original Shalini, too. Not sure I’ll ever be able to, though. I wholeheartedly approve of the 1/4-oz size for parfum. Sounds worth trying, too. Thanks, Angela! Ihadanidea sent a sample of the original Shalini to me in a swap. How sweet and generous! At that time, I had no idea how prohibitively expensive it was. Of course, my sense of smell can’t compare to LT but I didn’t find it note worthy… No pun intended. It sort of reminded me of a nice cologne. I can’t imagine that I’d like this new scent more because, oud. I do agree that small sizes are great for fickle perfumistas! Thanks for the great review Angela! You’re welcome! I understand how oud can get tiring. In this one, oud is there, but it doesn’t take over the perfume–jasmine does that! I’ve been loving my little sample, but a full bottle isn’t in my budget, either. I go through phases with oud and I do like a few, especially when it’s not the screechy, harsh sinus-burning variety. I’d sniff this if I came across it as it sounds quite pretty. I did get to sample Shalini (it was Sniffapalooza swag one year) and like Petunia, wasn’t blown away. It smelled more like soapy neroli to me and the sample turned surprisingly fast (probably high % naturals). I’m starting to think there’s a difference between natural and synthetic oud, and it really matters how out-dependent the perfume is. Oud can be a nice “spice” in a composition, but when it’s an all-out show, sometimes it feels medicinal. Jardin Nocturne does it well, I think. Too bad about your Shalini sample!